The former Gates Rubber factory comes down piece by piece, a few blocks to the east homes are popping up on vacant lots once in the orbit of what decades ago was Denver's dominant employer. "The site used to encompass housing that, presumably, served workers at the Gates plant," said Matt Osborn, president of the Colorado division of TRI Pointe Homes. After making way for parking lots in the 1950s then sitting vacant, the lots between Lincoln and Logan streets and south of East Mississippi Avenue are buzzing with activity again. McStain Enterprises completed some duplex homes last decade on those blocks before letting go of rights to the remaining lots during the housing downturn. Now it's TRI Pointe's turn to fill out an infill project with a 29-home development called Platt Park North. The project represents the first urban effort here for the California homebuilder, which has focused mainly on suburban projects since coming to the metro area in 2012. Two model homes are up and three properties are under contract, said Tina Martelon, director of sales and marketing for TRI Pointe Homes in Colorado. "We feel like we hit a good target," she said. Two light-rail stops are nearby, as is the South Pearl Street shopping district and Washington Park. Eventually, the former Gates Rubber site west of Broadway will be redeveloped. The single-family homes start in the $600,000 range and top $700,000 with added finishes, she said. 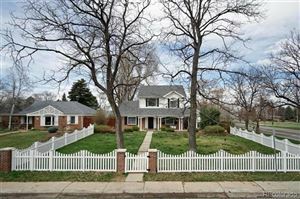 That represents a premium to the $534,302 average list price and $450,000 median sales price for the Platt Park neighborhood, according to real estate website Trulia. Given the location's appeal to households with commutes split between downtown and the Denver Technology Center, Wheaton expects the market can absorb the higher price. The biggest thing Platt Park North has going for it, he said, is that it provides new single-family construction in a city known for its apartment-building boom. Long and narrow with high ceilings and modern finishes, the residences have a feel closer to an urban townhome. Martelon said the designs include six different elevations, each with "active" and "passive" sides that prevent neighbors from seeing into each others windows. Between 2,209 square feet and 3,245 square feet, when the basement is finished out, the homes offer more space than the nearby bungalows built decades earlier when Gates was a magnet for workers.